Most of the songs Tenenbaum performed are by long-dead composers such as Bach, Beethoven, and Chopin. 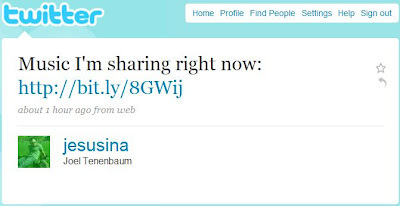 Their compositions are in the public domain, and Tenenbaum is free to perform, record, and "share" them all he wants. Another of the songs is called "Pop Songs without Words No. 2," composed by Jeffrey Chappell. Chappell is Director of Jazz Studies at Goucher (from which Tenenbaum graduated), and I'll assume he doesn't mind Tenenbaum posting his song. But if you were Joel Tenenbaum, having just been ordered to pay $675,000 for your infringements, wouldn't you be making sure you were purer than Caesar's wife on copyright issues, rather than tweeting about the music you're still "sharing"? the music sheets are widely available -- often for free (and many musicians can play by ear), so engaging in that activity, recording your own work, and sharing that performance -- is copyright infringement? The fact that something is "widely available" doesn't mean that it is in the public domain. So yes, making a recording based on a copyrighted composition and disseminating it over the Internet without permission is a violation of the copyright owner's rights. With a judgment like that, one may have (literally) nothing left to lose. At such a point, a political statement may be the only viable option. "based on" is pretty vague and subjective. Where does fair use come into play? Would Tenenbaum (or my daughter) be prohibited from playing The Piano Man at a public piano recital? If he publicly performed it, yes, he was required to obtain a license (it's likely Goucher had such a license from the PROs). (Or there may be some educational exception in the statute; I haven't looked closely at that question.) Fair use has not fared well in the context of unrestricted dissemination over the Internet. Depends upon what is meant by a "public" piano recital, but one thing is clear...a use of copyrighted music that in certain circumstances finds safe harbor as a fair use can easily lose such harbor if it is later splayed across the internet. E.g., "Sony" recognized the ability of persons to time shift for later viewing. Then taking the copy made for time shifting purposes and uploading it to the internet is a far, far different matter altogether and almost certainly exposes the uploader to potential liability absent the consent of the rights holder. This article is really not about a simple piano recital, nor is about the real likelihood that the rights holder may seek to assert his rights. It is about the apparent unwillingness or inability of Mr. Tenenbaum to recognize the consequences of his actions and his apparent refusal to play be the rule of law that governs how we interact as members of society. Mr. Tenebaum seems to be a likeable fellow, but it is abundantly clear that his judgment is clouded in a manner that I very seldom see. As Ben Sheffner notes, a verdict that brings down the "hammer" usually makes the recepient of such a blow to act in a much more circumspect manner because of the pain inflicted. Apparently Mr. Tenenbaum has a high threshold for pain and seems only too willing to endure even more. refused my strong admonition to "stop it" because he is simply inflicting more damage upon himself, I would likely petition the court to withdraw as his counsel. Perhaps now is the time for him to approach his father and ask for a referral to one of his distinguished colleagues. what if he paid for the music sheets. doesn't that entitle him to perform it? otherwise, what's the point of selling the music noture? I'm not sure you're quite telling the whole story on this issue, Ben. Generally, musical compositions are subject to compulsory licensing under section 115. Anybody who wishes to cover another artist's copyrighted song has the absolute right to do so -- even over the objection of the copyright holder -- as long as they follow the statutory steps for obtaining a compulsory license. The compulsory license gives the individual the right to distribute the cover song as long as they pay the statutorily prescribed royalty to the rights holder. Generally (if I remember correctly), the required royalty payment is based on the number of *sales* of the cover song or a percentage of revenues based on sales of the cover song. Therefore, if you are not *selling* the cover song, then you do not have to pay royalties. Here, it is most likely that the cover artists did not go through the formalities to obtain a compulsory license for the Billy Joel song. But because they are not *selling* the cover, they would not have to pay any royalties even under the terms of the compulsory license. Thus, they could argue pretty persuasively that: 1) permission from the rights holder is not required even if they were selling for profit, and 2) they are giving away the cover for free and would not need to pay royalties anyways. The compulsory licensing scheme as applied to them would be pure purposeless formality. By the letter of the law, they may be required to follow the compulsory license formalities, but I think that any court would hold that these formalities need not apply unless the cover artist is selling for profit. I cannot imagine that a court would allow a rights holder to collect statutory damages in a case like this. In any event, you brought this issue up and insinuated that the cover artists here should not have posted this because they might be committing an infringement. If that is correct, I'm curious not so much about the letter of the law, but about what your personal view is on this. Do you think that - regardless of the letter of the law - an ideal copyright regime should prevent students from sharing their recital performances on a non-profit basis? I'm also curious if you would support a songwriter who attempted to collect statutory damages for each download in a case like this. Again, I know that your post was meant only to state the letter of the law as you understand it and not necessarily to reflect your personal views on the proper scope of an ideal copyright regime, but I also think it's fair that we inquire into your view on the matter. Your description of the Section 115 compulsory licenses is incorrect in several respects, primarily because it ignores the issue of performances. Section 115 does provide for compulsory licenses of "covers" of previously released phonorecords. But one must still affirmatively obtain the license. And the license is only "to make and distribute phonorecords of the work." In other words, the license does not cover performances. I don't think there's any legal basis for your statement that "I cannot imagine that a court would allow a rights holder to collect statutory damages in a case like this." If you know of any cases that support your position, I'd be interested in knowing about them. I don't have time right now to give a detailed account of what I think copyright law should look like, but I do think that if one distributes/performs a song on the Internet without permission from the relevant copyright owners, yes, that is copyright infringement. 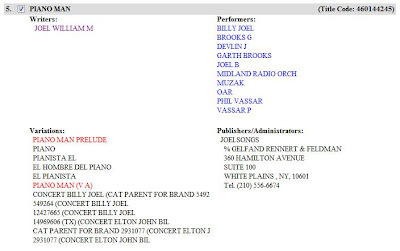 Actually Ben, Joel played the "Pianoman" on his Piano at this same recital. I witnessed it. Huh? I said in my original post that Tenenbaum played the song at the Goucher recital. And I assume Goucher has licenses from the PROs for that performance (or maybe there's an educational exception in the statute; I haven't looked). The issue is the unlicensed recording and posting to the Internet. Thank you, Mr. Sheffner, for posting this reductio ad absurdum, and then tenaciously defending it with such a straight face. You make the moral and social bankruptcy of your--and the industry's--position on copyright enforcement clearer than I could ever hope to. Keep it up, and you'll be our poster boy for statute reform. The complete lack of substance in your comment sums up your position very well. If you can identify any factual or legal errors in my post, by all means, point them out. Calling my positions morally and socially bankrupt may make you feel better, but it doesn't actually illuminate the relevant issues in this case. Tenenbaum and his legal team spent months railing at the perfidy of their opponents, as you do here, while neglecting their legal work, and failing to make a sober analysis of the facts and law arrayed against them. And look where they ended up. I thought I had made it pretty clear, but in case not: My point was not that Billy Joel should sue Tenenbaum. Rather, my point was that, having just lost, and lost very, very badly, he should be doing everything possible to show contrition, in order to convince the court to lower the award of damages against him. Instead, he blogs that the RIAA are "rotten bastards," and tweets about his "sharing" of music -- including music clearly covered by copyright. Such moves are reckless to the point of self-destruction. I have been reading this post + comments with great interest. I must say that you make some excellent points and I wholeheartedly agree with them. Although I can't say I side strongly with either the RIAA or Joel, since there are strong points made on both sides...I do think the psychology of Joel's behavior presently is very interesting. It is sad seeing this train wreck in slow motion. The meta-problem is that he is playing Jesus and absorbing punishment for faceless millions and is continually pushed by people on the internet...importantly, who have no personal liability in this, his, their "cause." For example, look at what happened when there was an opening for him to receive donations in order to settle his debts - Ray Beckerman (rightfully or not, I am not going to make a judgment) quickly cut out his one option to "escape" from this horrible predicament he finds himself in. The confluence of all these factors is leading to a sad case of self-immolation and self-destruction, that is independent of the larger issues of RIAA vs. the people. I only wish that people separate the theoretical issues involving copyright law, IP law, business models, etc. from the very personal and tragic set of issues that is the life of Joel Tenenbaum. Thank you very much for your informative blog.